Global Glass Tableware Market was value US$ 10Bn in 2017 and is expected to reach US$ 14Bn by 2026 at a CAGR of 4.3%. The objective of the report is to present a comprehensive assessment of the market and contains thoughtful insights, facts, historical data, industry-validated market data and projections with a suitable set of assumptions and methodology. The report also helps in understanding global glass tableware market dynamics, structure by identifying and analyzing the market segments and project the global market size. Further, the report also focuses on the competitive analysis of key players by product, price, financial position, product portfolio, growth strategies, and regional presence. The report also provides PEST analysis, PORTER’s analysis, and SWOT analysis to address questions of shareholders to prioritizing the efforts and investment in the near future to the emerging segment in the global glass tableware market. Some of the factors driving the glass tableware market growth include the growing tourism sector, especially the hotel and catering industry, developing retail industry, and gradual organisation of the market. Glass tableware contains crockery, cutlery, and other objects made from glass and is used for serving and eating meals at a table. Increase in investments in the hotel & catering industry in emerging countries, for instance, India and China have fuelled the growth of the glass tableware market. Furthermore, glass tableware products are widely used in the hotel & catering business. Also, a rise in disposable income of consumers has resulted in an increase in expenditure on travel and tourism. 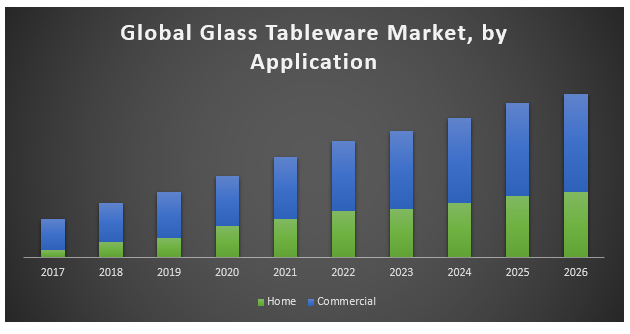 Increasing standard of living of consumers in the developing countries, rising disposable income in emerging countries and the growing middle-class population are the key reasons which drive the growth of the global glass tableware market. The increasing cost of raw materials is major restraint of the glass tableware market globally. Beverageware segment is anticipated to experience a CAGR of 3% during the forecast period due to a rise in demand for fine dining and rapid urbanization. Beverageware raises to the vessels that contain beverages or liquid food for consumption. Beverageware segment is father classified as Tea Pots, Coffee/ Tea Jugs, Pitchers and Coffee Brewers. Coffee jugs held the largest market share in the beverageware segment compared to teapots and are anticipated to remain the same during the forecast period. Commercial segment is leading the glass tableware market due to containers or objects made from glass and mainly used for commercial use. It includes drinking ware, dinner ware and other useful items for practical also champignon, candle container. The change of marketing channels may form a new competition situation in the upcoming future. Region-wise, Asia Pacific has the highest market share of the global glass tableware market in 2017 and is expected to continue its dominance during the forecast period timeline. The middle-class population in the Asia Pacific is expected to increase due to economic development in the APAC region. The consumption rate of glass tableware products is higher in Europe and the Asia Pacific as compared to other regions.